WE START WITH A LARGE POT OF MEATY MARROW BONES AND RAW JOINT BONES, WITH THE NUTRIENT RICH CARTILAGE STILL ATTACHED AND COVER IT IN WATER. THEN, WE ADD A SMALL AMOUNT OF ORGANIC APPLE CIDER VINEGAR WHICH HELPS TO DRAW THE MINERALS OUT. IT’S SIMMERED AND SLOW COOKED FOR 2 FULL DAYS TO EXTRACT THE MAXIMUM NUTRITIONAL VALUE OUT OF THE BONES. THE END RESULT IS ONE OF THE RICHEST NATURAL SOURCES OF GLUCOSAMINE, CHONDROITIN, MSM AND HYALURONIC ACID AVAILABLE, IT’S A GELATIN CONSISTENCY WHEN CHILLED AND WILL THAW TO THICK GRAVY THAT CAN BE POURED OVER YOUR PET'S FAVORITE MEALS. Why SHould I feed My Pet Bone BRoth? BONE BROTH IS AN EXCELLENT SOURCE OF IMPORTANT MINERALS AND HELPS TO REINFORCE THE IMMUNE SYSTEM. IT’S ALSO A QUICK AND EASY WAY TO HYDRATE YOUR ANIMAL WHEN THEY’RE SICK OR JUST NOT DRINKING ENOUGH WATER DURING THE DAY. ADD A LITTLE BONE BROTH TO A BOWL OF WATER AND MIX IT UP TO GIVE THEIR REGULAR WATER A NOURISHING DOSE OF NUTRITION AND A SCRUMPTIOUS TASTE. 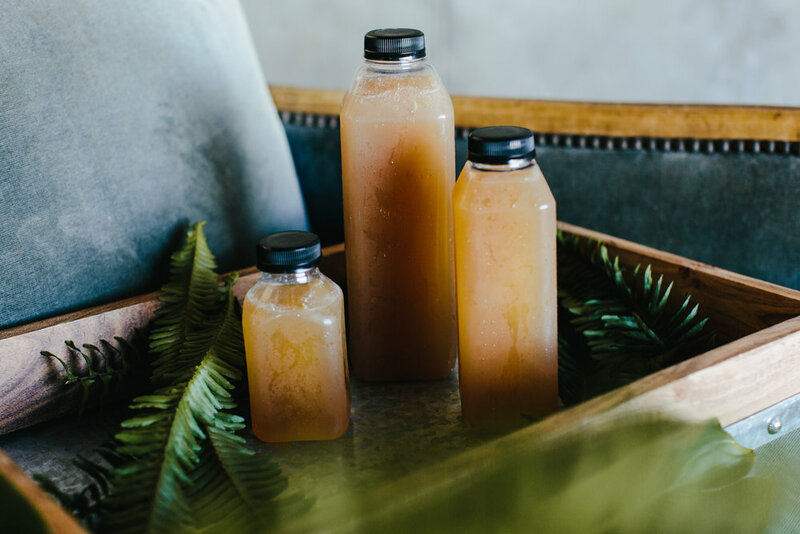 THE GLYCOSAMINOGLYCANS FROM BONE BROTH ARE RESISTANT TO DIGESTION AND THEREFORE CAN BE MORE EASILY ABSORBED IN THEIR INTACT FORM- THIS STIMULATES THE PRODUCTION OF COLLAGEN IN THE JOINTS, TENDONS AND LIGAMENTS. How Can Bone Broth HElp My Pet? YOU CAN FEED BONE BROTH AS A SNACK OR OVER MEALS DAILY. LARGE BREEDS OVER 50 LBS. CAN ENJOY UP TO 2 TABLESPOONS PER DAY.